This week, guitar heavyweights as Joe Satriani, Steve Vai, Kenny Wayne Shepherd and Eric Johnson have paid their tributes to the genius of Jimi Hendrix by blogging and selecting playlists exclusively for MusicRadar. In addition, we also asked you to contribute to a special page of tributes to coincide with the 40th anniversary of Jimi's passing on 18 September. Ben Slater: "My thoughts on Jimi Hendrix: In the words of the man himself, 'Music is my religion'. Burn guitars not Korans!" Simon Ensor: "Hendrix died because god needed a guitarist." Steve Bello: "Hendrix was the reason I got serious with guitar back in the day." Eric Carillo: "I was only eight months old when Hendrix died. It wasn't until 20 years later when I felt his impact on the music world and also myself. Not necessarily his playing style, but his coolness, his ability to create such vivid sounds and his guitar's interpretation of his own personality and beliefs was very inspirational and uplifting. He loved what he did and wanted to share his gift with anyone who wanted to listen. The world needs more 'Jimis' to make things peaceful and groovy." Steve Pierce: "For me Hendrix is the source, he defined the electric guitar as an art form, in terms of it as an instrument for expression, rhythm, lead, performance, and the blurring of the lines between those. He did pave the way. He is the most consistently listenable artist of my post-16 life… the one artist I always come back to! A constant, a reference point, the still point around which everything else in the guitar firmament revolves. He is the one, the unattainable goal that keeps us striving to be the best that we can be!" Terann Elizabeth Hilow: "Cited multiple times for reinventing the guitar's sound, Hendrix is one of the greatest innovators in rock 'n' roll history. He was doing something in music at the time hadn't been done; Clapton, Page, and other legends from that beautiful period of music that we call classic rock all say they were stricken with awe at what he was doing. "His approach was seductive, raw, and unpredictable; in essence, his music teases listeners as they stay on their toes and wait for the climactic moment, but he makes the wait entertaining and so worthwhile. Few could pull off what Hendrix ultimately accomplished in music, and he continues to be the inspiration for players today." Sam Barnett: "Jimi Hendrix had the uniqueness of being a very versatile player in a time when rock and pop was still dominated by guitarists doing their minor thirds. If he was still alive today, he would have a rich back catalogue of experimental music he didn't have the chance to make whilst oppressed by record companies." Peter Gosling: "We lost an incredible, innovative musician who was well ahead of his time. People still use his licks and phrases, but there will never be another person who could string along a succession of notes and make you smile one second and cry the next. He was only here for five minutes, but he touched everyone's lives then and continues to do so this day. Rest in peace James Marshall Hendrix. 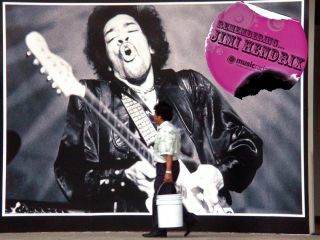 Meet you on the next one, I won't be late...."
Wired2max: "Hendrix shook the world in the 1960s with bizarre beauty. Nobody combined raw technicality, expression, ingenuity, aggression and charisma like Jimi. And nobody ever will. Couple that with the burgeoning counter-culture movement, and you've got yourself in icon." BikeSwan: "Jimi Hendrix is the ultimate expression of what a human being can be. He is the light that all of us should strive to be like. Laid back enough to never find life annoying, yet passionate enough to give us the greatest music of all time. RIP."